Chinatown is changing: Familiar old institutions like Mitzie’s and New Town Bakery have undergone makeovers, but it’s the young entrepreneurial ventures in the area that are signalling the beginnings of something new, fresh and daring in this sister ‘hood of the 4th most stylish neighbourhood in the world. The Chinatown Experiment is one such enterprise embodying the heart of this exciting movement. Q: Could you give us a brief run-down of how TCE came together? A: Its inception happened in two steps. I had dreamed of running a contracting company that used more efficient processes and technologies in renovations. As things got running, there was never enough time to try out new things. And running a full time business in its first year the risks were just too high to try to go against the grain. So I came up with the idea of renovating a storefront as a construction experiment and using the information and the final product as something small to medium contractors could learn from. Then on a trip to Portland, my friends and I kept visiting these eclectic interesting businesses and I would always hear the phrase “This wouldn’t ever work in Vancouver”. To which my response was “Why not?” And the answer invariably was despite the high volume of creative people in Vancouver, the costs and red tape are massive barriers to entry. And so the Chinatown Experiment’s hypothesis was born: If you provide a low risk environment for ideas to be tested and grown, the diversity of small businesses in Vancouver and B.C will be able to grow. Regardless of the stage of your business idea, we can help design a pop up event to test it out. Q: What are some upcoming projects at TCE we can look forward to? A: We have some unique pop-ups coming soon from Sugo Sauce (www.sugosauce.com), Jordan River Soapworks (www.jordanriversoapworks.com), and Shoppalu.com. We are also working on some interesting events, for example a musical influences/history exhibition, in the new year. I advise people to keep track via facebook.com/thechinatownexperiment. We are in our first month of operations so we will have a lot coming in the future. Q: What are some tips you have for those applying for the two day no expense give-away for December? What are some essential qualities you look for in future collaborators? A: What we are looking for is people with a goal. They are people who are looking to grow their business and learn how to do it better. They provide value to the community and are interested in creative approaches to business. Its important to note we are different from an art space but we are open to artists/designers who are interested in bridging the divide between art and business. Q: There’s a real spirit of mutual benefit and cooperation at TCE, if you could sum up your philosophy in a sentence what would it be? Q: Is there anything else you’d like people to know? A: We are available for straight pop-up rentals if people are interested in just using the space. We are evolving to provide a complete turn key operation for people to just walk in and run with their ideas with the logistics established. Also I hear often people say, “I want to try an experiment, but I’m not sure what I want to do.”I invite them to contact us (dvn.mcknz@gmail.com) and we can collaborate and help form that idea. On your way to TCE you’ll notice that the boarded up windows and scaffolds on the 400 block of Columbia street from just a few months ago have been replaced by three new store-fronts standing all neat in a row, the sidewalk much friendlier and cleaner looking than it used to be. According to Devon, this is thanks to the Association of Chinese Freemasons’ initiative, the owners of the building, who obtained a heritage restoration grant in order to make useful again the long-defunct commercial space. After obtaining the lease, Devon got to gutting the insides and using those same materials to fix it back up, discovering during the process that those underground passageways that occupy the murky territory between fact and urban legend are, in fact, real. Apparently the tunnels run underneath the whole city block, with the majority of the doors down there welded shut. So creepy – so good. Above ground, Devon has left the interior of the Chinatown Experiment intentionally unfinished for the purpose of garnering comments and ideas from the community and collaborators on the specifics. The Chinatown Experiment is flanked by Duchesse, a vintage store, The Shop Vancouver, a men’s goods and coffee shop, and Positive Negative, an artist-run gallery. From now til this Sunday, October 14th, you’ll find unisex apparel and goods by Toronto-based, female-run apparel company Muttonhead. Their pop-up shop has adopted a variety store theme incorporating other fine local and Canadian products carefully selected to entice discerning passers-by. Their apparel focuses on local sourcing and production, using recycled materials when possible – the designs are classic-casual; utilitarian and minimal. Be sure to get there early this Saturday for their pop-up store closing party, where all second Muttonhead garments purchased will be discounted at 30% off. 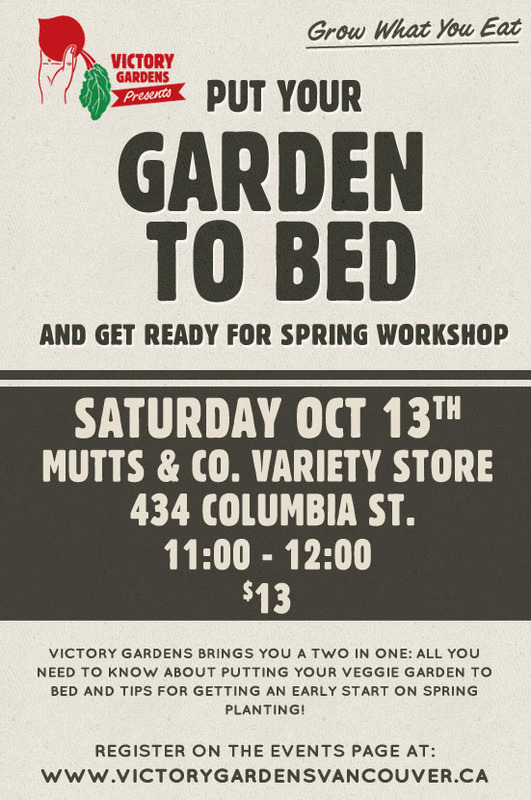 Also on this Saturday is the Victory Gardens Workshop: Put Your Garden to Bed and Get Ready for Spring, where the lovely girls of VV will answer all your questions about what you can do winter-side to secure yourself a happy garden: A perfect pre or post brunch activity. Secure your spot here. Next articleNeed a new bike helmet? Walrus wants to give you a SAHN!